A three-part model consisting of a carbon fiber shell, side rails, and a foam core. Templates can be imported into the Pinnacle Model Based Segmentation library for insertion into plan. Most of the time you can use the default scripts to see the correct isodose lines on a plan. But sometimes another "non-standard" dose is prescribed. This is a way to get the right isodoselines (107% & 95%) on a plan. 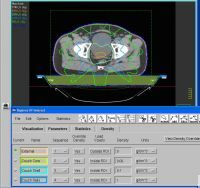 This script generate a radiobiological (LQ) transformation of the physical dose distribution which incorporate fraction size effect so it is possible estimate with more precision the biological effect of the treatment. This script creates 10 (or 20) subarcs in Eclipse from a RapidArc plan with 1 or 2 arcs. The 10 (or 20) subarcs are in a single plan so that the plan is easily exportable to RadCalc. This excel spreadsheet will function as a tangent calculating sim sheet while it simultaneously creates a framework for drawing a wire contour. Workbook for performing hand calculations. The MLC shape import on the first 6 sheets is designed to receive from CMS XiO. EXCEL spreadsheet containing QUANTEC dose limit guidelines publised by IHJROB in 2010. This is a Pinnacle script with documentation that automatically prints a series of PS files, converts them into one PDF file, and FTPs the file to a remote server. These instructions will take you through the process of changing the machine ID for a set of beams in XiO after an optimized set of compensators have been created. Use this when using French XP and French Eclipse. A new way of making your own menu windows.